November 05, 2016, 2:52 p.m.
Few Americans expect a new era of waxing American power, it seems, regardless of whether America chooses Trump or Clinton next week. This is according to new research by the YouGov-Cambridge Centre – a joint centre for public policy research run by YouGov and Cambridge University. Results were produced for an event by the Cambridge University Forum on Geopolitics, discussing what the first 100 days of a Donald Trump Presidency might look like. As findings show, Americans tend to expect that American influence will decline either way, with 42% saying that America will decline under Trump and 36% expecting the same under Clinton. They are, however, more likely to say that American influence will grow under Trump (33%) than under Clinton (25%). When it comes to trade, the picture is far less mixed. 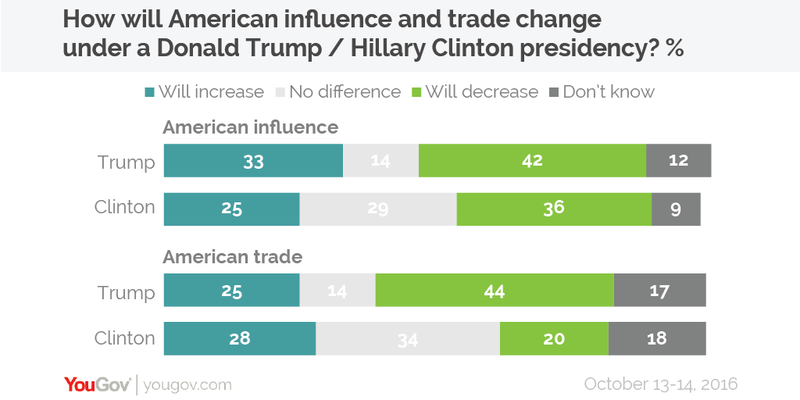 44% of Americans expect trade to fall off in the event of protectionist Trump entering the Oval Office, while only 20% expect the same from Clinton. One area where there is a notable difference is on the issue of US-Russia relations, with Trump being seen as less likely to prompt some sort of clash with Russia than Hillary Clinton. 29% say that Putin will be more likely to threaten the United States under Trump, while 41% say the same about a potential Clinton presidency. 37% say Putin will be less likely to threaten the United States under Trump, with only 18% saying that Clinton is more likely to improve relations. Americans have low hopes for Trump when it comes to the state of America&apos;s alliances. 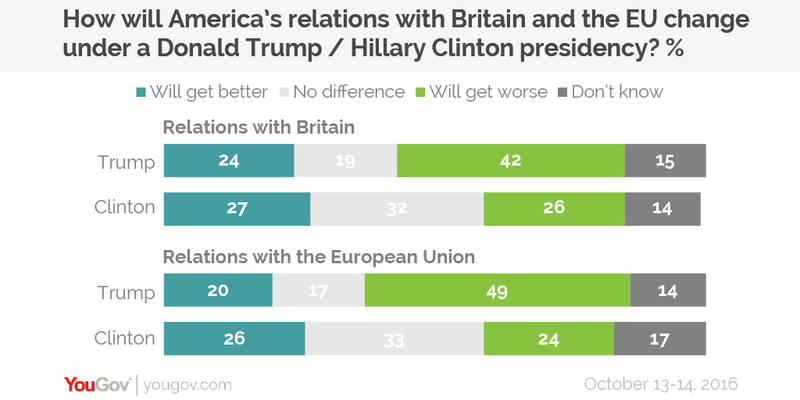 Expectations for improved relations with the UK or EU are low (around 25%) for each candidate, but people are notably more likely to expect worse relations between the US and EU during a Trump presidency (49%) than a Clinton presidency (24%).